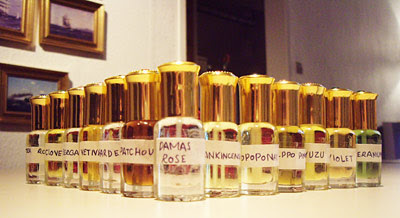 I've just ordered a bunch of oils like this in my quest to find the ultimate rose frag. It sounds to me like you are looking for a good rose mukhallat HDS; unless of course you prefer to wear a diluted pure rose oil. Mukhallat Al Emirates I can recommend. I've blogged about it here before. I loved reading your descriptions. I have a tiny sample of Aleppo Pine soap, it does smells very fresh and clean like but it's a smooth sweet freshness that...well I couldn't put it into words as perfect as yours and I also can't quite put my finger on what it reminds me of. I bet all these oils are synthetic, arabian perfumers are no different than western perfumers. Le critique, I have indeed identified several as being synthetic. The person who sourced these travelled with a local who spoke the dialect and performed a rather extensive search through the medina. The dealer they found admitted that the larger part of his stock were synthetics, but a portion were not. When asking others to collect oils for you, there is always a risk involved, particularly if they are unable to distinguish the obvious synthetics from the naturals. But I am confident in their research and efforts. One can't forget that some of the middle eastern countries are known for their local distilleries and quality essential oils. Mediterranean is full perfumes. The perfumes made around from Mediterranean. Mesopotamia, Ancient Egypt, Ancient Greece, Rome.